The green house is just as I left it before settling in for the Winter, complete with pests. I notified Garden Mole of the problem after spreading some pixy dust and picking a few weeds. 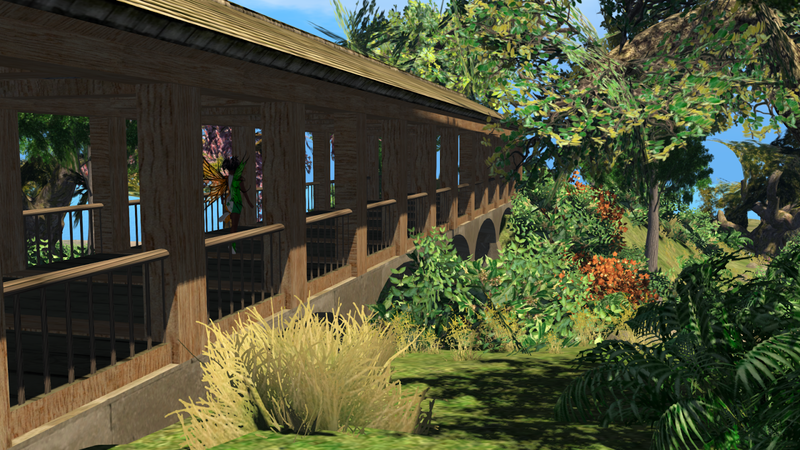 The neighbors have kept up their adjoining properties so this is still one of the most lovely roadside spots in all Second Life. Even the Rezz Zone was clean! I had to teach a new generation of frogs to leave the butterflies alone and go for the pesty bugs, but otherwise everything was shipshape, almost as if another pixy had been in before me to sort everything. Of course, this isn't any one pixy clan's territory so I was safe and glad to help, though I should have worn something red to show my peaceful intent instead of my Irish pride outfit. Better safe than sorry. The bridge weathered the cold season very well and I just had to sweep up a bit. All the bushes and grasses were thriving so rainfall must be good so far this year. Might need to trim some back in a few months. The path around the back end of the property is clear as only a few rocks had to be moved so those who can't fly can get around. It's a nice stroll and the bench at the path's perihelion is in good repair, too. It wasn't until after I sent this snap that the huge spider under the other arch came to my attention. This might need some Linden attention. Maybe you could get Michael or Guy to expedite an exterminator? 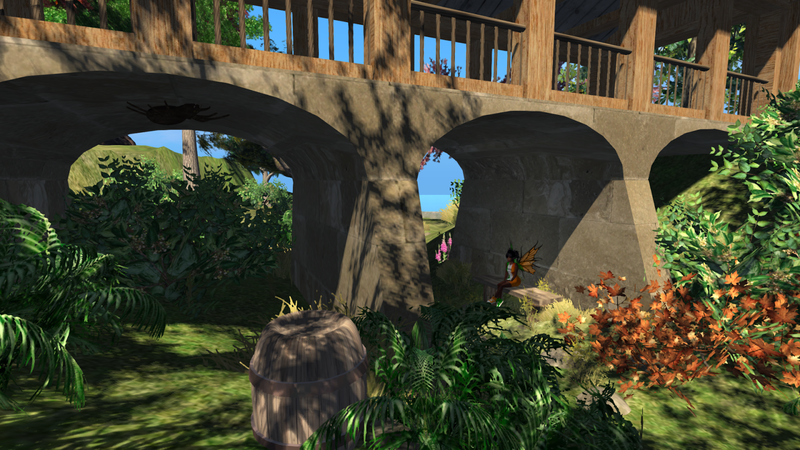 On warm days the bridge will provide some welcome shade for weary visitors. Might need more benches for those who don't bring blankets. 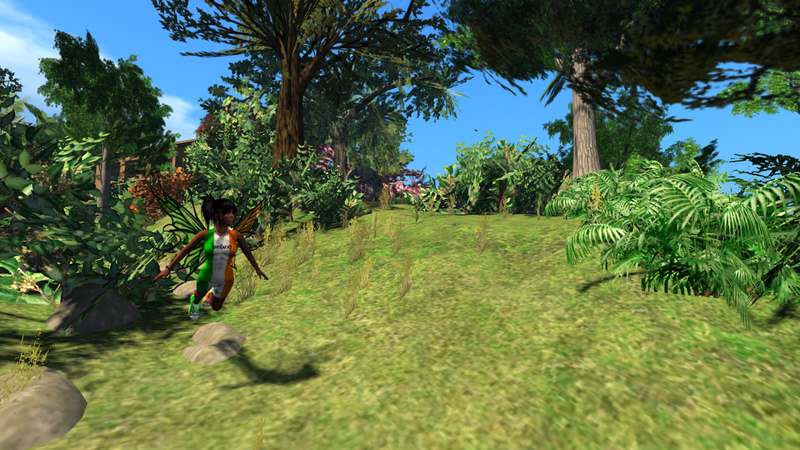 After all the weeding, dusting, and – well, to a pixy all that isn't work – it was nice to rest by a fire at the shrine. The mushrooms glowed merrily as the fireflies and the Will-O-Wisps danced in the air. A great way to end the day. 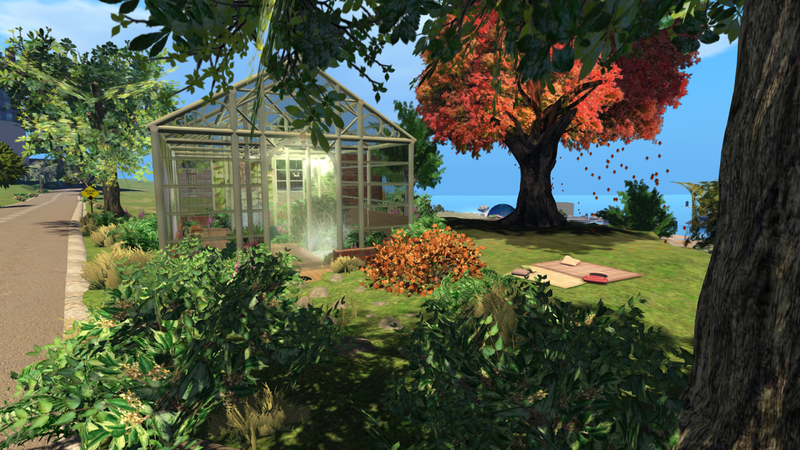 I'll have to visit the green house in Clearwing (SLurl) soon to see if it needs any post-Winter cleanup. Nothing makes a pixy happier than a well-tended garden so I know she'll be flitting about Our World more often and plying her skills. That means she'll probably have more reports and I'll publish them here if they might appeal to the general public. Drop her a line directly or leave a comment on this post if you know of a garden or such she should look into sometime. Dunno why but somehow I admire pixies'n'stuffz.